Ein wenig erinnert der Stil der Italiener von 4th ‚N Goal an Billy Talent. Fröhlicher, mitreißender Sound mit bretternden, punkigen Beats gepaart mit angenehmen Männerstimmen. Wenn „Turn on the Light“ kein Erfolg wird, dann weiß ich nicht…. The time has come! 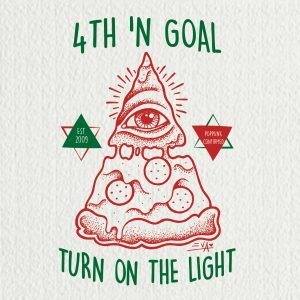 Anticipated by the self released EP, „Turn on the Light“ is the first full length record ever released by the 4th ‚N Goal, Italy’s most acclaimed pop-punk act. Written at lightiningspeed after returning from the awesome experience as first Italian band who ever played Vans Warped Tour in California, the 10 tracks move from classic pop-punk vibes to the finest EZ revival everyone is talking about. The record was mixed and mastered at Fusix Studio (Upon This Dawning, Daylight, Last Day Before Holiday) with a track mixed by Sam Pura (The Story So Far, State Champs). Most of the tracks are recorded directly by 4th ‚N Goal. The album also features a guest appearance by Matt Arsenault from „A Loss For Words“. If you loved their hilarious rendition of „Bring Me The Horizon’s“ „Drown“, you’ll be more than happy to find it among these tracks. There is no other way to put it: music is over. There is no one to blame, it’s all about bringing a right conclusion to a project that has given us so much. Thanks to all those who allowed us to live experiences that will be impossible to delete from our minds. We have always tried to do our best every single day in the last seven years and all we have given has always come back in the form of experiences that taught us music is 100% worth living for. We are proud of everything we have done and the way we did it . See you on May 21st for one last time. Thanks for everything. Klingt stark nach Auflösung. Laut eigener Aussage spielen sie am 21. Mai ihren letzten Gig. Hoffentlich nur temporär. Wäre sehr schade um die talentierten Jungs.